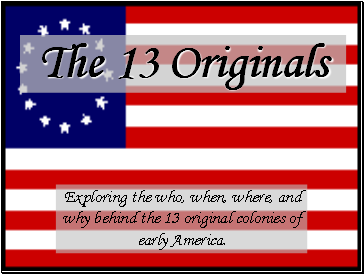 Exploring the who, when, where, and why behind the 13 original colonies of early America. 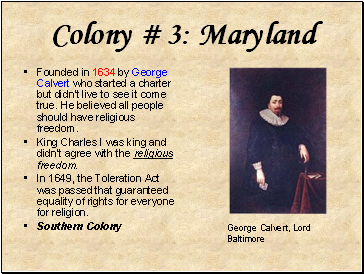 TLW: Identify the 13 original English colonies, when they were founded, who established them, and why. 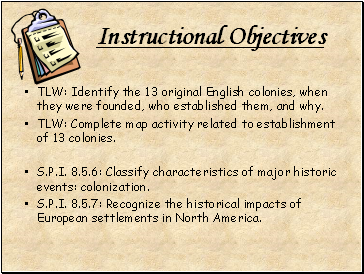 TLW: Complete map activity related to establishment of 13 colonies. S.P.I. 8.5.6: Classify characteristics of major historic events: colonization. S.P.I. 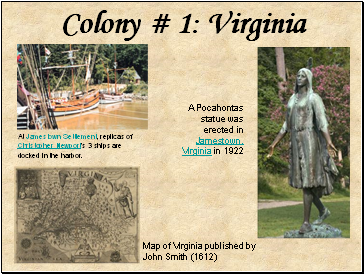 8.5.7: Recognize the historical impacts of European settlements in North America. What would it be like to start a new town? What kind of obstacles would you face? Would you have enough support (money and friends) to do it? 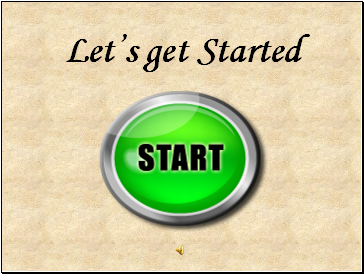 Is there something you have ever tried to start in your life that might be like this? 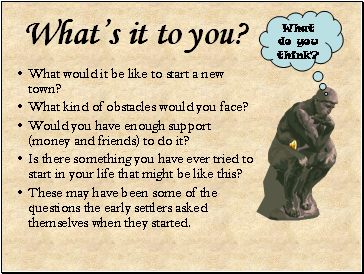 These may have been some of the questions the early settlers asked themselves when they started. 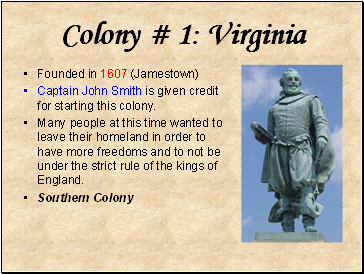 Captain John Smith is given credit for starting this colony. Many people at this time wanted to leave their homeland in order to have more freedoms and to not be under the strict rule of the kings of England. At Jamestown Settlement, replicas of Christopher Newport's 3 ships are docked in the harbor. Founded in 1620 by the Pilgrims. 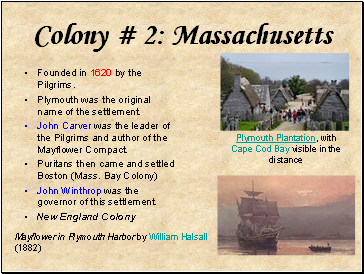 Plymouth was the original name of the settlement. 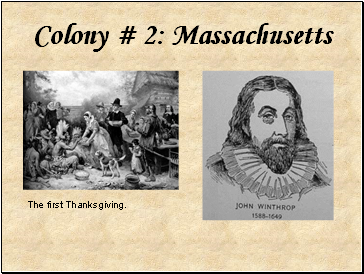 John Carver was the leader of the Pilgrims and author of the Mayflower Compact. John Winthrop was the governor of this settlement. Founded in 1634 by George Calvert who started a charter but didn’t live to see it come true. He believed all people should have religious freedom.